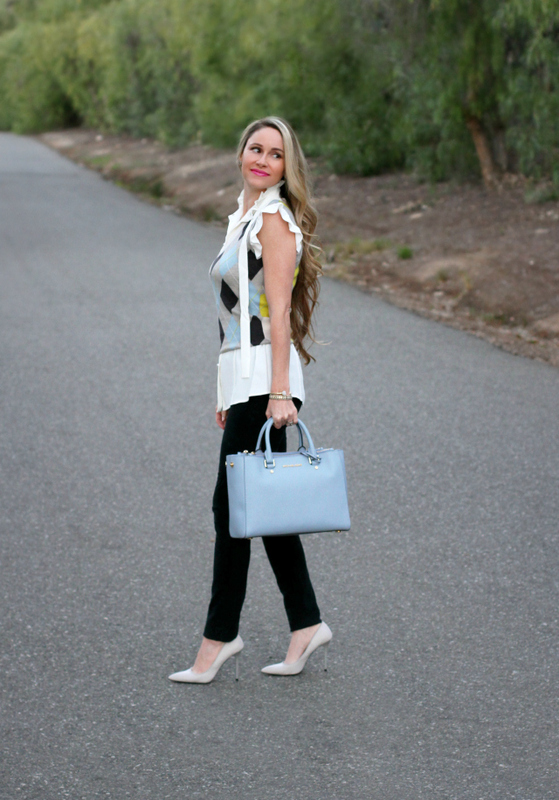 Tie-neck blouses are always on heavy rotation in my wardrobe, as you've probably seen in my Instagram gallery. I love how feminine they are and how they can dress up any outfit. Once I saw the ruffled-trim and pearl-button detailing on this ivory one, I knew it was for me. Not only is it too cute for words, but I knew it would serve as a versatile piece for the office and after-hours. I'll be styling it two different ways in a mini blog series, the first one being a dressy-casual look I'm featuring here. This is the kind of outfit I usually wear for dinner with friends or other weekend get-togethers where I want to be dressed down from my usual skirt-blouse pairings, but still look put-together. It's also a great business-casual outfit for those of you with more relaxed dress codes at the office. Lately, I've made it my goal to "shop my closet" more and re-style several of my longtime faves that haven't seen much wear in awhile. I usually infuse new life into these pieces by mixing them with newer favorites, as I'm doing here. I'm layering the ruffled blouse under an older sweater vest in a preppy argyle pattern, which I bought from Express years ago. I've always loved the modern twist of its argyle pattern with the contrasting colors on the front and back. The front has a combination of grey, blue, and cream, while the back has a combination of grey, chartreuse, and cream. It's such a fun and unexpected detail! Since the vest is more of a classic, almost menswear-inspired piece, I like that the blouse offsets it with its pretty, ladylike, ruffle trim peeking out from the collar and sleeves. The slim-fitting and cropped fit of the vest also does a nice job of highlighting the blouse details that I love so much. If the vest were any larger or longer, the layered look might become too bulky and unflattering. The vest should hit at a narrow part of the waist so your figure doesn't get lost. And with a blouse like this layered underneath, it gives it a slight peplum hem -- another of my favorite looks, which is flattering on most body types. If you're not a fan of argyle, you can easily substitute it with another pattern or with a solid color. There are several nice sweater vest options that would create the same look. You might try this, this, or this. Another older wardrobe favorite I've incorporated into this look is this pair of black, stretchy jeggings from American Eagle. I bought these while I was pregnant with baby #3 because they were so comfortable and allowed room for my growing bump (I used the popular "rubber band around the open button" trick to get the most wear out of them.) They're a looser fit on me now, but a quick wash and dry on high heat in the washer and dryer shrinks them down a little bit. Even with a relaxed fit, I like the way they look and feel. I might invest in a newer pair, and am happy to see that this season's versions here and here look identical. Stay tuned for a follow-up post, where I'll be styling this blouse in a very prim-and-proper look. I love this outfit! I wear sweater vests a lot, but havent thought to pair it with a ruffled short sleeve shirt before - thanks for the inspiration!